Most PVC pipe used for ports has a wall thickness of only 2 - 3 mm, meaning a very tight turn for the air, causing whistling and turbulence. The normal approach is to flare the port intake with a flare that is a similar size to one fitted the port exit. Where this is not possible, a donut style ring is worth fitting. If there isn't enough clearance for this, a smaller smoothing ring will always fit. The inspiration comes from ram tubes used in race cars. If you are making more than one, it is easiest to do them all at once. 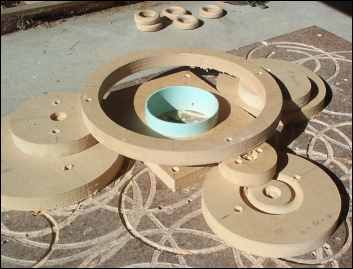 Screwing your sheet to a sacrificial board underneath allows the use of screws to hold the centres of any circles cut out, preventing the circle jig from moving when the last little bit is cut. Make a ring that has an internal diameter equal to the OD of the port tubing. The outside diameter of this ring is the ID of the port plus the radius of the rollover bit times four. This ring is the bottom ring in the following drawing. If you are only making treatment for one port, you will need to make another identical ring to use as a spacer in the next step. Make another ring that has an ID equal to the port ID minus 10mm, and an OD that is 10mm larger than the first ring. Make up a mounting board with a stub of pipe that is 3 thicknesses long. Slide a pair of the small rings onto the stub as shown. Remove the circle cutting jig from the router and fit the rollover bit. Cut around the ring as shown here. Use some scrap to support the outside edge of the router to keep it level. This photo shows the mounting stub surrounded by a large ring at the correct height to support the router. Remove the rings from the stub and glue the freshly cut ring to the larger ring made in step one. 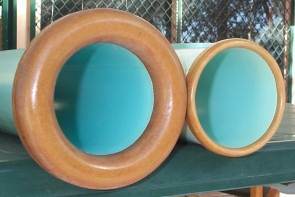 Replace the stub of pipe with one that is only two thicknesses long. Push the glued rings on and use a flush-trim bit to open up the ID of the donut to match the ID of the port. Remove ring from stub and hand sand any sharp edges.